How Strong Will Loft Boarding Be? Very strong because we use purpose made18mm tongue and grove particle board which gives a strong secure fit. It's safe to walk on and store on distributing weight evenly over the sub-frame (the frame work we build underneath the boards) surface allows really safe strong storage. To help achieve a safer more stronger platform we build a self supporting sub-frame above your existing joists using internal walls and purlins to strengthen the boarded area. Our timber framed 200mm self supporting sub-frame does not rely upon your existing ceiling joist unlike other companies who use inferior battening or 3x2 laid directly on to your existing ceiling joists which will weaken them. 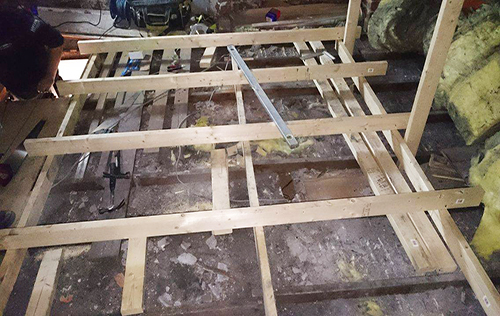 Your ceiling joists are only meant to hold up the plaster ceiling, it is not a floor and therefore a bespoke sub-frame must be built above the existing joists and self supported to make it strong and safe to use. Tall loft insulation, can I still board my loft ? Yes, depending on the height required to build the sub-frame storage floor above any cables, light fittings, pipes or loft insulation we use either a timber 200mm raised double self supporting sub-frame, which is mainly for houses 50+ years with a purlin style roof or for more modern properties (Within the last 50 years) with a truss styled roof we use a 270mm raised LoftZone store floor system this raises the new storage floor to a more suitable level to avoid loft insulation compression especially in new build properties with government recommended insulations levels. Compressing your loft insulation is a bad idea as it will reduce its efficiency considerably and may cause damp and condensation issues. Removing it is not an option either as this will leave a area that will lose heat quicker and start to cost you money on your heating bills. See LoftZone store floor link below for the ultimate loft storage system for lofts with tall insulation. Can I Fit Loft Boarding Directly on to My Ceiling Joists? No, especially with older properties with weaker ceilings, its just not worth the risk cutting corners to save a few quid on materials when it can be done properly. Doing it properly includes strengthening, installing supports, leveling, making safe and future proofing so as not to cause damage to your ceilings especially with all the weight stored up there in the years to come, and for a little more money why risk a cheap alternative. Seriously, many people have regretted it. Ceilings are not meant to hold any more weight than for holding up your ceiling plaster boards or lathe plaster, so consideration in to the correct type of sub-frame and support is crucial. Not all lofts are the same hence the reason we carry out free surveys so we can inspect and advise of how your loft can be utilised for storage. One of the first things to consider apart from the ceiling joist strength is how high your ceiling is, we need to measure from floor to ceiling height as some ladders may not reach. We then have to measure your existing loft opening making sure it is of a comfortable accessible size to allow you, your ladder and what ever you carry up in to the loft. In some case especially on older properties with old lift off wood hatches a new energy efficient hatch will need to be installed so you can safely access your loft with a loft ladder to store in. Head height is important, we will need to measure the head height from the loft opening to the roof, its no good if you bang your head or have to lay down to get in to your loft. After checking on these crucial details we must allow clearance for the fold away ladder. 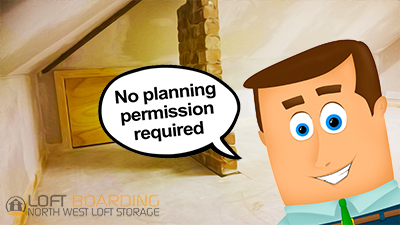 You do not require planning permission to board a loft for storage. Planning permission is only required for major works or large attic / loft conversions for living extension purposes. However in some homes the timber joists may not be adequate in strength to support a "load" or storage weight. 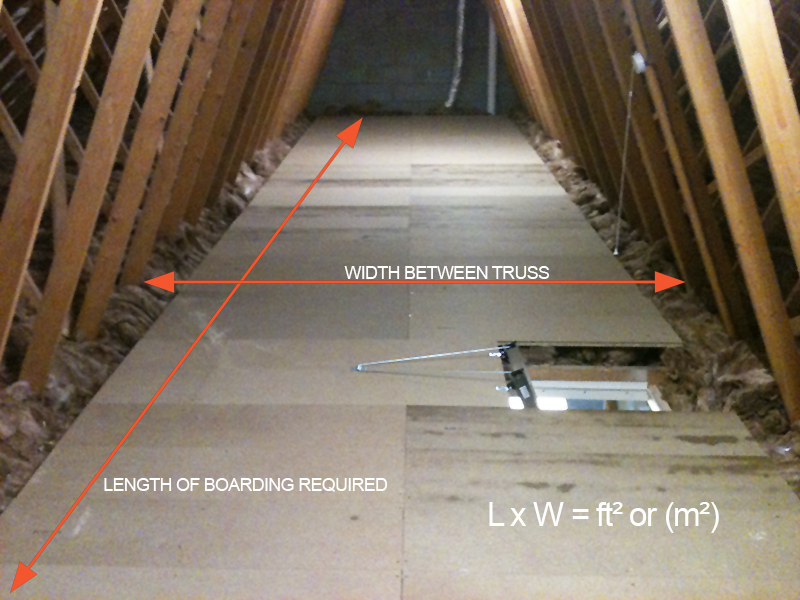 This is why we must do a survey to determine if your loft has adequate ceiling joist to allow the loft to be boarded. Most ceilings are only designed to take the weight of the plaster ceiling and any extra weight must not be put directly on to the existing ceiling joists. In most cases with older properties approximately 50+ years the ceiling joists must not be used as support so a self supporting sub-frame needs to be build above the existing ceiling joists. 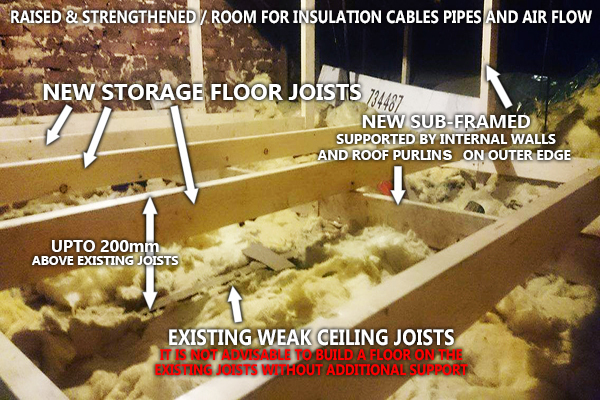 In most new houses the joists may only require a simple sub-frame building to support the extra weight (see below for more information) but some may also require a raised sub-frame to be of a correct height to avoid loft insulation compression or removal. Building Regulations & Building Control? Although we always work to building regulations where applicable, and always make sure your existing joists are supported or strengthened building control can be a grey area sometimes when it come to building work, so if you decide to have your loft boarded for storage, mini loft conversion or luxury loft storage and depending on where you are in the country, type of property (listed or other) and what you are having done this may or may not require a building regulations application to building control. No planning permission is required but a wildlife license may be required if the work affects protected species like bats. This information is available by contacting your local building authority. What Area Can I Board For Storage? Normally we only board areas which are accessible by standing or kneeling but not lying down. Keeping your storage area central highest point will be most practical. No point going to the unnecessary expense of boarding your eaves as they are to low and not really that accessible, plus you need to keep these areas clear so as to allow airflow around your loft, this is very important. New build properties are completely different to older purlin style roofs house such as Pre-war terraced and detached. Timber self supporting sub-frames are required in these houses to add support and strength so as not to rely upon the exiting ceiling joists so a much safe stronger area can be gained. Can I board all of my loft ? No completely boarding your loft is not advisable as it can prevent air circulation in your loft and lead to condensation build up, so best to leave the lower outer areas like the eaves free from boarding. And as mention its just adding unnecessary expense boarding an areas that you cant reach easily so therefor you wont use. 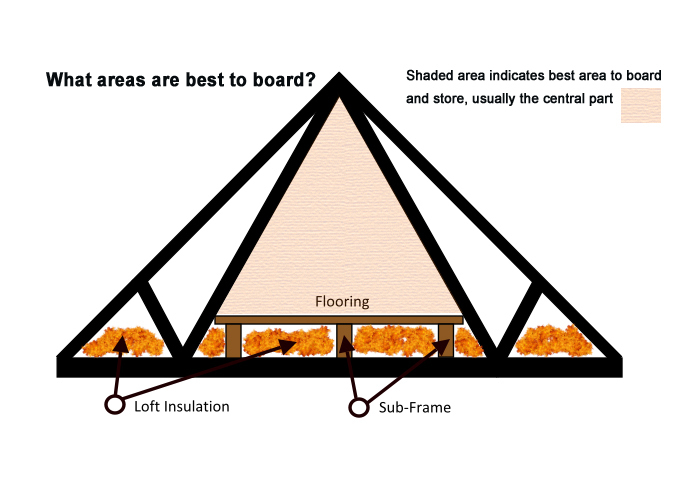 Any area can be boarded providing the area in your loft will allow it and it can be made strong enough to allow boarding, this will be checked by our loft boarding surveyor. 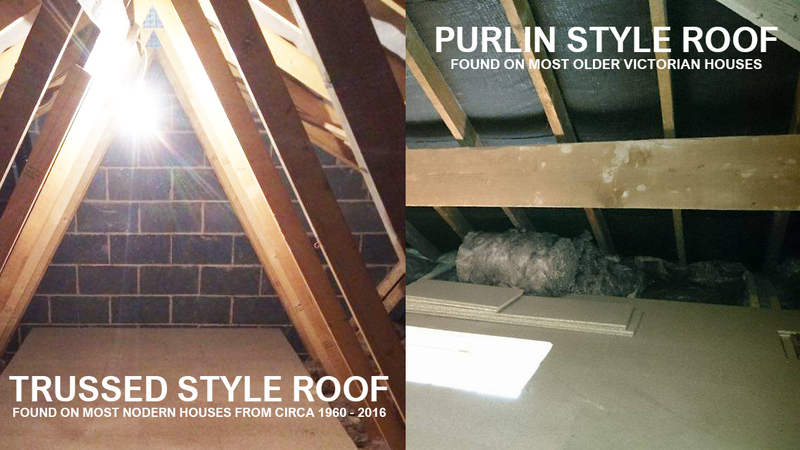 Below are examples of different systems we use to create a safe, strong storage floor in your loft. This will give you a better idea of how we professionally construct your loft floor to make it strong to walk and store on. What is a Sub-Frame For? Sub-frames are basically a supporting frame under the boarding to allow the boarded area to be raised above the insulation and / or for adding better support and strength. 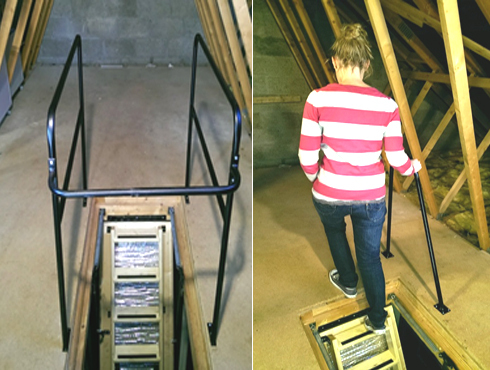 See examples below of different sub-frames we use to create a safe, strong storage floor in your loft. 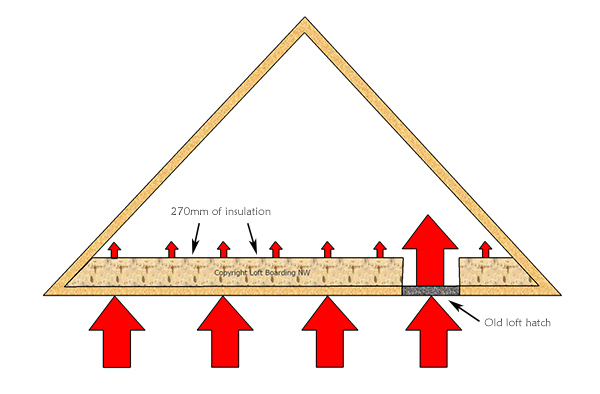 Any loft that have any insulation protruding above the joists will require a sub-frame of some kind to suit the joist type before boarding. You must allow your insulation and loft to breathe. Stopping air circulation in lofts by boarding all of your loft or blocking eaves, roof or soffit vents can caused problems like condensation build up which may lead to damp ceilings and loft timbers. Do not squash insulation down, and if you use a sub-frame above your insulation do not box in the ends leave the end so air can pass underneath your storage floor and through the insulation so it can work efficiently. Using a unique system of steel joists and strong plastic triangle shaped supports we can create a extra strong and safe professionally raised floor for storage in your loft without the need for major work. We can give you an additional height of 270mm above your joist level for loft insulation to sit neatly and correctly without compression in between this system. This is ideal for most new build and houses built circa 1960 with a trussed style roof. Purlin style roofs are usually support by large wood beams or steel RSJ's which spam across the rafters supported sometimes by central walls and outer wall or party walls. Purlins are usually found in older Victorian / Edwardian properties and were used commonly for many years until around 1960 when they started to change to Trussed style supported roofs. Trussed Style roofs are the most popular roof support for all standard and common new builds you see today. They can vary with different web configurations but the most common is shown in the photo below. They started building with trussed roofs circa 1960 which is a very clever design being that the ceiling joists are built in to the roofs structure so giving excellent ceiling support every 600mm or so. It was an improvement from the old style purlin roof which had to take its ceiling support from additional rafter hangers. Although when they were built this was quite adequate but building practice's have changed many many times and these hangers need replacing with larger ones or additional supports. 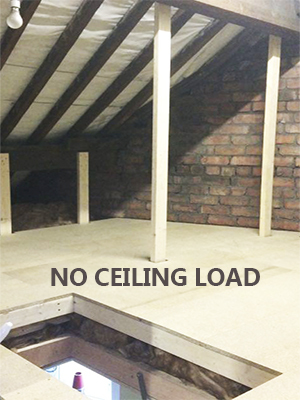 Its not ideal to board your loft for storage directly or by some timber batten resting onto a weak ceiling. See more info below on the methods we use to get over the weak ceiling problem of older terraced or detached houses. This sort of sub-frame is best suited for trussed roof systems where there is no ceiling plasterboard or insulation, for example a garage roof void or a roof that is so shallow it cant take the height of 270mm StoreFloor system. We can span timber across to get the correct spacing, height and support to have loft boards placed down as the fixing height can be variable. LBNW Timber Supported Sub-Frame For Older Houses With Weaker Ceilings? 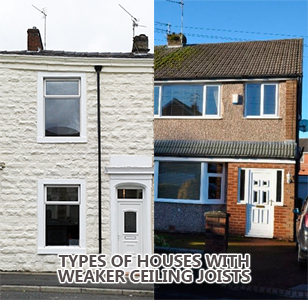 We come across allot of weaker ceilings or ceilings with smaller joists than normal and we advise not to just board direct tot he joists or batten and board directly to the joists because the ceiling joists are to weak to allow the additional boarding & storage weight (load). Mainly older terraced and detached houses pre WW2 and after WW2 when we started building again we had a short supply of materials so houses were built to a very minimal specification. Although your ceiling joists are adequate (in most cases) to support your ceiling only they were never designed to take any extra weight on them so they must be strengthened or built above correctly to allow boarding, storage items and you to walk about safely and by adding more support this will prevent problems in the future. Insufficient strengthening or supporting of a storage floor will cause problems with weaker ceilings and unfortunately allot of "loft companies" out there are not aware of how to create strong safe storage sub-frames (storage platforms) in a loft. Installing directly or on some 3x2 batten only increases the load on the existing ceiling and will not strengthen it. Add your storage items, you and someone else and without the correct extra support and your ceiling could essentially be dangerously overloaded. There is more to it than you think, see the pictures below? this shows the extra work that goes in to creating a level self supporting storage platform. The sub-frame is hung in places where it cannot bear down on your existing joists for support, usually above the central area of a bedroom, near the light where there is no additional support. Hangers must be fitted to the purlins to help support and suspend the sub-frame in most cases as this is required before any boarding can be installed. Cutting corners to falsely reduce quotes for loft boarding is common place in this industry so this mean using inadequate materials and will not conform to any regulations. We will not cut corners just to falsely reduce costs like others do. But is it really necessary to build a sub-frame? You can get a load calculation done for your loft storage requirements before you have loft boarding installed but this is not required and can be quite costly. Newer built properties however (with a truss roof in the past 50 years or so) are a little different as they have support from a web truss frame that is installed in your loft every 600mm and supports the roof and ceiling all in one. So our LoftZone raised loft floor system can be installed directly to this type of ceiling to gain height above the insulation of 270mm so you can create a storage area without removing or squashing any insulation. It is bad practice to remove or squash installation down to board your loft for storage and this is why your new build developer or builder don't like to recommend using your loft for storage because of the cowboys doing this from the past. Loft Opening Not Big Enough ? Having updated your insulation level to the government recommended 270mm, but what about you badly sealed and in efficient out dated loft hatch? The most important part of retaining heat in your home is to heavily insulate the ceiling area at the top of your landing and update the old loft hatch to a more efficient modern building regulation spec hatch. Your upstairs landing is where most of the down stairs heat ends up and a poor weak loft hatch will just let it all through costing you lots of money every year. 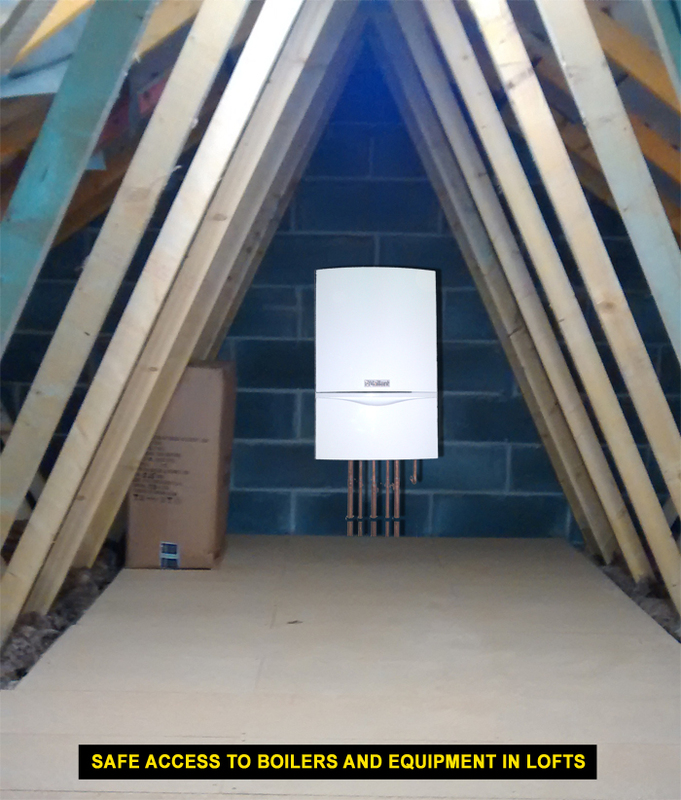 There is no point having an heavily insulated loft and leaving in the old inefficient loft hatch. Reverse hinging an old wood loft hatch is no longer seen as good practice as it does not comply with air leakage requirements of Part L of Building Regulations. Also your loft hatch needs to be a good size to allow items, a ladder and yourself to pass through. The revolutionary design of the multi-point catch mechanism means that this door (picture below) can maintain a more effective draught seal around the entire accessible opening, helping to meet the air leakage requirements of Part L of the Building Regulations and preventing the problem of moist warm air entering. This loft door has been independently tested by the BRE to BS EN 13141-1:2004, and easily surpasses the requirements for air leakage which are outlined in the current building standards, certification is available. The door is unlocked by hand by sliding to open the catch mechanism. This door can also be used in conjunction with the aluminum, concertina or wood loft ladders. 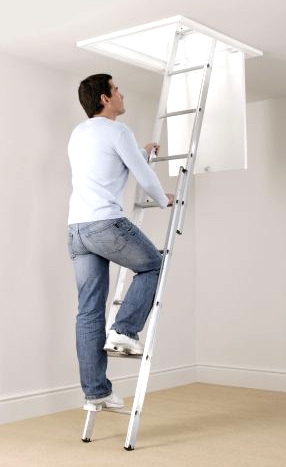 In some cases we come across customers who need a larger loft opening or may not have the space for a aluminum floor mounted ladder to stow away, so the alternative is to install a larger more convenient loft ladder complete with framed hatch. Wide 84mm and deep timber treads for comfort when climbing. with spring-assisted stowage and wide, sturdy wide treads for comfortable climbing. 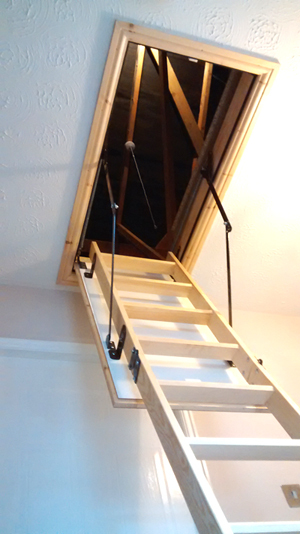 This loft ladder is stored within the trapdoor so no loft floor space is used. If you struggle to operate a loft ladder but still want to use your loft for storage how about a semi automated timber loft ladder with extra long loft hatch. Intelligent safety awareness, by constantly measuring its progress the system can recognise when something is jamming or pulling on the trapdoor. Heat rises, and in a home with just half of todays recommended levels of insulation a quarter of your heat is lost through the roof. Insulating your loft, attic or flat roof is a simple and effective way to save that waste and reduce your heating bill. Loft insulation is effective for at least 40 years, and it will pay for itself over and over again in that time. If your loft is already insulated, it's worth checking that you've got enough insulation to get the maximum saving. If everyone in the UK installed 270mm loft insulation, we could save nearly £210 million and almost 1 million tones of carbon dioxide every year, the equivalent of taking nearly 364,000 cars off the road. Installing 270mm of loft insulation will save the average household around £187 a year. Estimates taken from Energy Saving Trust website. As part of our loft boarding packages we do loft insulation from as little as £5.25 a square metre for 100mm and £6.99 a square metre for 200mm supplied and installed. Please note: we can only supply and install insulation as part of a loft boarding package, we do not just install loft insulation. 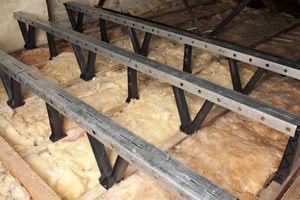 Storing items in your loft incorrectly can compromise the efficiency of your loft insulation. 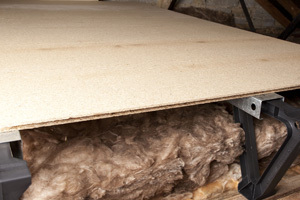 Putting boxes and suitcase away in your loft directly on to your insulation will start to cost you more money on your heating bills because you are effectively making it possible to breath and circulate air through the fibre's. Wool fibre type loft insulation must be none compressed so air can circulate through it to be at it most effective. Boarding directly on to insulation or squashing it down in between your joists will also reduce it efficiency considerably. So you want to add more insulation and use your loft for storage? 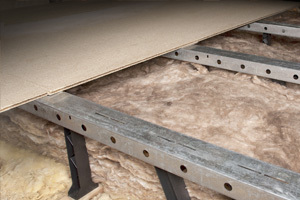 There are now specialist products that allow you to create a raise loft storage floor consisting of sturdy tri and uni-support 270mm legs which support a metal cross beam section that allows you to board on to without compromising your insulation. Loft safety is very important, accidents can happen and helping prevent them especially in lofts is very important. 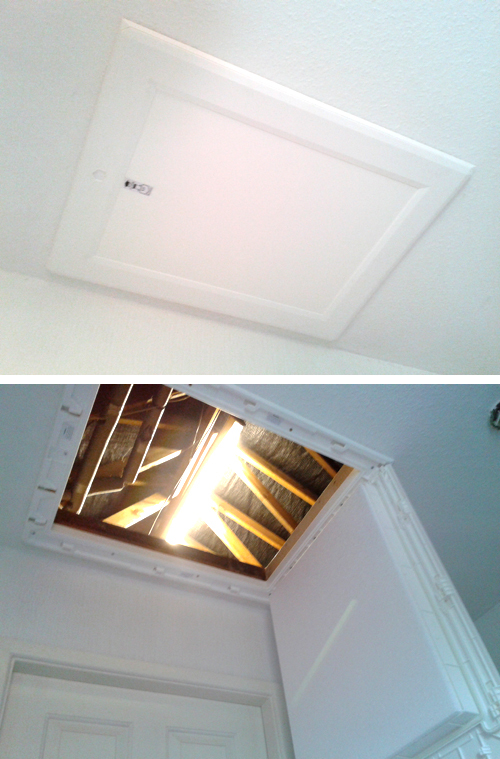 The most common accidents in lofts are falling through the ceiling and falling down the loft hatch opening. In both cases we can help prevent this from happening by installing good quality strong flooring in the areas you want to access and install a rail or balustrade around the opening of the hatch to stop anyone from walking backwards or stumbling toward the loft hatch, its a long way down and could be quite nasty so its worth considering installing a safety balustrade or railing. We can make and install simple wooden balustrades or we can installed universal metal rail version which simply install to your loft joists or flooring. If you need a helping hand getting in to your loft why not have installed a hand grab rail to assist your balance when climbing the ladder in to the loft area. We can also create a safety balustrade around the edge of the boarding to prevent stepping off the safe boarded area on to the plaster board ceiling. We often get asked to create a working platform, stage or walkway for any contractors who may need to access your loft to work on Boilers, Solar panel equipment, TV or networking equipment, pipe work or electric cables. A contractor can refuse to do this work if there is no safe area to walk on or if the access to your loft is bad. We can help provide easy safe access to your equipment in your loft by providing what is recommend for working at height safety requirements. A strong purpose built stow away aluminium ladders must be fixed in place with lockable sections when pulled down to use. 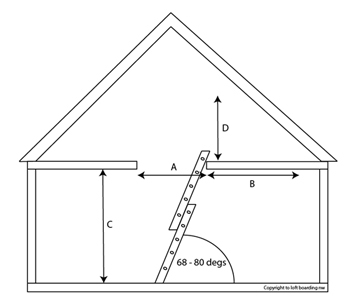 A safety rail must be provided to surround the hatch to protect anyone falling down the loft opening from inside the loft by walking backwards or stumbling towards the opening. A secure purpose built platform must be provided to allow a safe walkway and to surround the apparatus / equipment to be maintained. Several working areas can be provided which are accessed off the main walkway. The walkway / boarding must be constructed by using a raised sub-frame system to avoid compression of any existing loft insulation. Any insulation compression will diminish the effectiveness of the insulation considerably. Lighting is important for your loft, you need to see what you are doing and where you are standing. We can install a simple LED light bulb and pull switch so you can immediately switch on the light before stepping off your ladder, no point having a switch further inside where you cant see to switch it on. We install LED bulbs as standard nowadays or fluorescent tubes as an alternative . LED bulbs are soon to be the norm, as everything is converting to LED because its much cheaper to run than the older incandescent bulbs and such like. 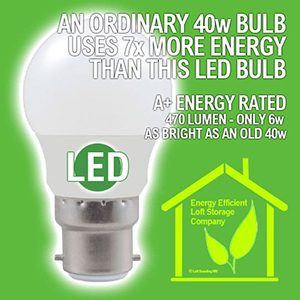 A 6w LED bulb is equivalent to the old 40w incandescent bulb which gave off around 470 lumens. The choice is your, the cost is not really much between them and it really depends on how much area is boarded in your loft to how much light you'll need. When going for lighting the modern way is to chose is by Lumens not watts. 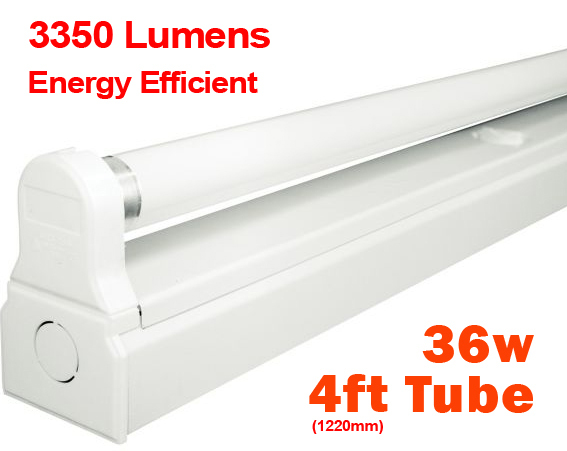 Fluorescent tube lighting is our most popular because it has a very high Lumens rating (for the watts output) and spreads the light much further than a standard bulb. If you plan to use your loft quite a lot for storage. eBay, hobby or study room then we recommend a tube light.